Doncaster Rovers and manager Dave Penney have parted company. Penney guided Rovers to promotion from the Conference to League One and their highest league position in 50 years. "After seven years as player and manager, the club and Dave feel a change is necessary," read a statement from the club. Rovers have appointed director of football Mickey Walker as caretaker manager for the game against Port Vale on Sunday. The statement from the club added: "Dave feels he's taken the club as far as he can. "We will not stand in the way of his ambition." Penney, 42, spent five years as a bricklayer before becoming a professional footballer at the age of 21. Derby County gave Penney his professional break, and he went on to play for Oxford, Swansea and Cardiff, before hanging up his boots with Doncaster Rovers. 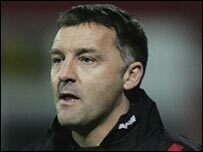 He took over the managerial reins at Rovers in December 2001, taking over from Steve Wignall. Penney's sudden departure has prompted speculation about his future, but Doncaster chief executive Dave Morris said he was unaware of any specific interest. "I'm sure he'll want to bounce back into management at some time, but whether he's got something lined up, I don't know," said Morris. "What he has done here is outstanding. He took Doncaster from the Conference to League One - you cannot deny his record. "The works he's done here over the years, not just on the field, but behind the scenes to establish Doncaster at this level is second to none." I'm glad he's left as it is indeed time for a change but couldn't he have done it during pre-season? Meanwhile, Rovers chairman John Ryan said the club would not rush to make a new managerial appointment. "I think there'll be plenty of people interested in the job here, it's going to be a crucial appointment for us but I'm in no rush to make it," Ryan told BBC Radio Sheffield. "I think Dave was disappointed when a bigger club didn't come in for him in the summer. "He saw Paul Simpson go from Carlisle to Preston and Phil Parkinson from Colchester to Hull. Dave has a better CV than the pair of them."